Celebrating 50 years of service to the San Francisco community. Join us in celebrating our 50th Anniversary Celebration Dinner. 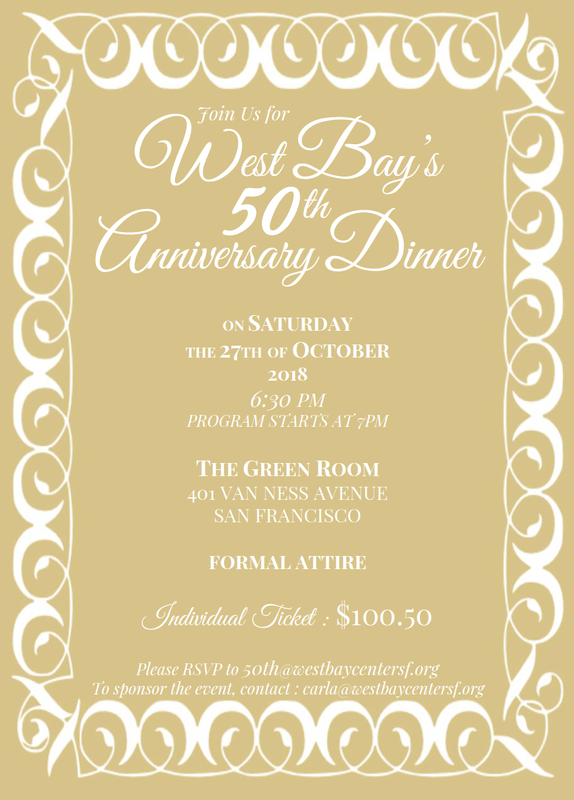 We are celebrating 50 years of service to the San Francisco community by having a celebration dinner honoring our community leaders, supporters, and our West Bay families, youth and seniors from the past and present. West Bay currently provides services to 100 clients ranging from ages 5 to 89, on a daily basis in a 1,000 square foot space. We have been exceeding our current space requirements while still providing quality programming to our youth, families & seniors. To continue our work in a safe and successful way, our Year 50 goal is to raise $500,000 for a building down payment. We want to secure a permanent space for the community West Bay has been serving for the next 50 years. To purchase a ticket to our 50th anniversary dinner, click here. To sponsor our event, click here. To buy one of our exclusive 50th Anniversary shirts, click here. To buy West Bay apparel, click here.